The Joyo JF-301 Rated Boost is a surprisingly versatile pedal. Although its 'intended' design is as a clean boost, which it is exceptionally good at, don't be fooled into thinking the Rated Boost is only a one trick pony. With single coils and the drive cranked you can get some very 'Stones'-esque tones like an 'AC30' just at the point of breaking up but with the ability to clean it up by picking lighter or rolling the volume off just slightly. With Humbuckers and the drive cranked up you can coax some great light blues-drive tones that would make you think you're playing through an old vintage low wattage amp with the volume flat out. The clean boost that the Rated Boost is capable of can be massive or miniscule, you really do have so much control with this pedal. There is a huge amount of extra volume on tap. You could use it as a pure clean boost or you could combine it with the drive control and get a slightly more driven/saturated tone to give you more sustain (as I do). You could use it to equal the volume differences between your humbucker equipped guitars and your single coil equipped ones. It can also be used in front of an overdrive or distortion pedal to help overload the input and give you a more defined and heavier overdrive/distortion. You could also use it as an always on pedal just to really fatten up your tone and give it that extra 'sparkle'. With the High & Low controls you can tailor your tone exactly as you want. You could fatten up single coils or brighten up Humbuckers. You can tame a particularly bright guitar or brighten up a darker one. Bass players can use it to thicken up a rhythm part or help accentuate a slap bass part. This really is a hidden gem in the Ironman series and would be a welcome addition on almost anyone's board. The JOYO JF-301 Rated Boost Clean Boost Mini Guitar Effects Pedal is an exceptional all round Clean Boost mini guitar effects pedal. The JF 301 Rated Boost is taken from the 3rd generation of JOYO pedals a result of 8 years of JOYO technology and expertise. Compact, versatile and with a metal housing will ensure this pedal fits easily onto any board . Flip the lid to keep your tones protected, the LEDs shine through when active. 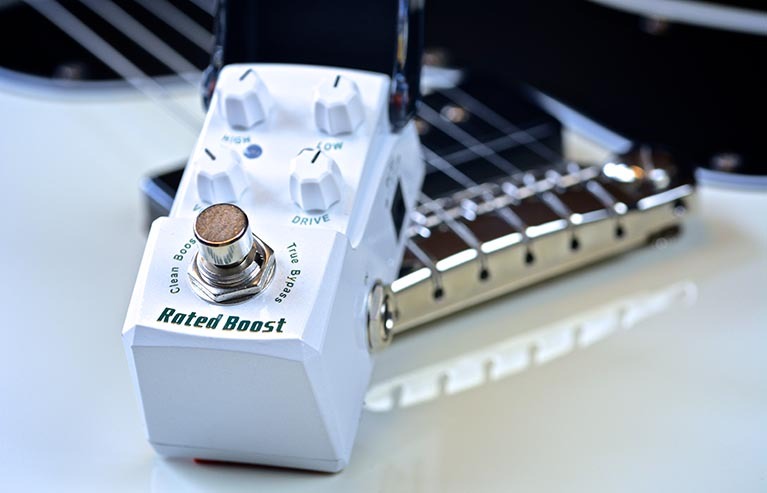 JF-01 rated boost clean boost, NEW mini Guitar effects pedals from JOYO. B STOCK - THE PEDAL WORKS PERFECTLY, TRIED AND TESTED, NO MARKS OR SCRATCHES..LITTLE JOYO STICKER MI..